You may or may not have come across a teensy-weensy debate or two when perusing the web, Facebook, blogs, etc….debates where moms are criticizing others for the ways they are raising their children. I certainly have my convictions and am happy to share those with others. =) But the way I do things is not the only way. Many kids are being raised (and have been raised!) 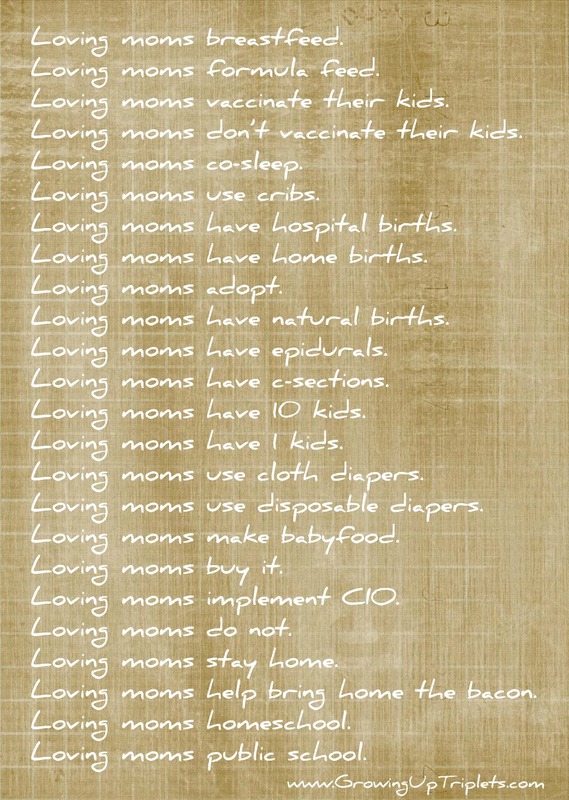 in loving, happy homes and are parented in completely different ways. None of us appreciates being made to feel we are doing something unloving for our kids. (However, shouldn’t we all be open to evaluate – through others’ suggestions and information-sharing – how we could improve? I think so!) The point is that we are all seeking the ways in which our families will be best cared for. None of us sets out to harm our family! And certainly none of us knows what we are doing while we are doing it! No matter how many kids we’ve had! Each one is different and requires different parenting methods.